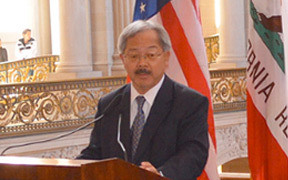 Mayor Edwin M. Lee announced today that the City and County of San Francisco in partnership with the San Francisco Interfaith Council will launch a new funding program that will provide resources and support to non-profit and community-based organizations serving immigrant communities. The new Immigration Defense Fund will bolster San Francisco’s frontline immigrant-support organizations. These non-profit and community groups provide legal representation at deportation hearings, citizenship and asylum services, and legal counsel for unaccompanied minors, among a bevy of other services.